What does the adoption of the ‘Mandela Rules’ mean for prisons and prisoners in Uganda? Doreen Namyalo Kyazze from the Foundation for Human Rights Initiative in Uganda joined the PRI team at the UN Crime Commission in May for the adoption of the revised Standard Minimum Rules for the Treatment of Prisoners (the Mandela Rules). Here she explains some of the challenges facing prisons and prisoners in Uganda – the growing number of prisoners on long sentences, lack of mental healthcare, abuse and use of prison labour and disciplinary sanctions – and says that the adoption of the Mandela Rules is an important opportunity to press for change in prison policy and practice. During my 10 years of experience working with prisoners, I have witnessed many challenges facing prisoners and prison administration in Uganda for which reform is impossible without an adequate regulatory framework. I outline a few of the challenges below. The number of women in prison has been growing year by year. While the women’s population was approximately 1,879 in 2014, compared to 1,447 in 2012 (1). Current prison planning does not in many respects take into account the special needs of women. Poor legal representation is a common problem. We hear many reports of no contact between accused and lawyer at all, and inconsistencies in the defence lawyer assigned to a case and lack of preparation by lawyers are frequent occurrences. In a recent survey we conducted of 194 women prisoners (10% of the total female prison population), 12% of the pre-trial detainees and 33% of the convicted had no idea whether or not they had even received legal representation (2). We have a growing number of elderly prisoners due to the increased use of life/long term sentences following the landmark ruling of Susan Kigula & 417 Ors Vs A.G, which, while positive in itself, resulted in many former death row inmates having their sentences commuted to life (3). Uganda currently has approximately 4,500 prisoners serving long-term sentences (10-45 years) and 90 prisoners serving natural life sentences (4). 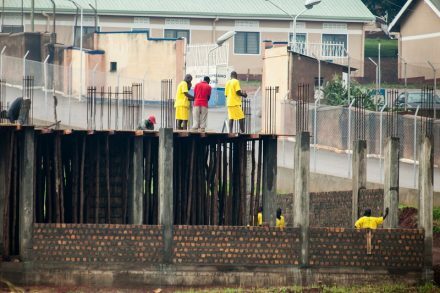 The current state of prison infrastructure does not provide specialised facilities and equipment for these inmates. Worse still, the prison staff do not have the technical capacity to manage such prisoners. While there is a general problem in the recognition of mental health issues in Uganda, there are currently 90 prisoners who have been diagnosed as having a mental illness by a health professional. The prison budget for mental health is a meagre 100 USD per quarter. The current law on mental health – the Mental Health Act 1964 – is outdated, defining a person of unsound mind as ‘an idiot or a person who is suffering from mental derangement’ (5). This Act provides that an inquiry into ‘soundness of mind’ is to be conducted by ‘two medical practitioners, one at least of whom shall be a duly registered medical practitioner’. ‘Medical practitioner’ is defined as ‘a person duly registered as a medical practitioner under the Medical and Dental Practitioners Act’. This implies that a dentist could be sufficient to decide whether or not a suspected offender is mentally ill. Under the law, mentally ill prisoners can only be released on direct order of the Ministry of Justice (6). However, there is no timeframe within which the Minister should act. The welfare of prison staff is also overlooked and is given inadequate attention at the policy level. Prison staff pay is below that of other public servants, despite the difficult job that they do. Another issue that has been around a long time but has yet to be resolved is prison labour. There are no clear guidelines spelling out conditions under which prisoners should work, their hours of work, remuneration and sanctions for officers who violate the set guidelines. So, in light of these challenges, the adoption of the Mandela Rules is very significant. Although not legally binding, the Rules present an opportunity for policy reforms and practice change in the criminal justice system in Uganda. They will guide government, policy makers, civil servants and CSOs towards improving the standards in places of detention and to ensure that our penal system preserves the dignity of prisoners and turns our prisons into correctional institutions for the good of our society. Of particular interest to me are amended Rules on the provision of healthcare by prison systems, particularly Rule 25, which states that the prison healthcare service must consist of an interdisciplinary team with sufficient expertise in psychology and psychiatry, and Rule 109 which requires mentally ill prisoners to be transferred to mental health facilities if their continued detention would mean exacerbating their condition. Rule 61(3), which says that each prisoner should have access to effective legal aid, is also a particularly relevant provision in the context of Uganda, as are Rules 97 and 102, which regulate prison work, prohibiting prisoners from being subjected to slavery and servitude and requiring working hours for prisoners to be fixed by law. Lastly, Rule 37, which confirms that the use of disciplinary sanctions must be subject to authorization by law will also be hugely important for our work with prison administrations. In a visit to Mpigi prison, for example, we found an inmate who was subjected to corporal punishment for failure to help other inmates while at the farm. According to the inmate, she finished her part earlier than the rest so decided to sit and wait for the others. The prison official found her and asked her to assist. When she declined, she was severely beaten. For these reason, it was very exciting to work along the team of PRI at the 24th session of the Commission on Crime and Crime Prevention in Vienna, Austria on the final stages of the review of the Standard Minimum Rules for the Treatment of Prisoners. Upon arrival my colleagues took me through the UN procedure and I realized how complicated the process actually is. I learnt that the negotiations among member states were intense and the role of NGOs like PRI was complex in the four year consultative period. Informal negotiations of the Resolution on the revised Standard Minimum Rules for the Treatment of Prisoners, prior to submission to the ‘Committee of the Whole’ of the Crime Commission, were protracted, in particular because of the tradition at the UN in Vienna to adopt by consensus every initiative that comes before the Commission. I had an opportunity to familiarize myself with the negotiations in the Committee of the Whole during the week, when another resolution was negotiated, involving intense negotiations by different delegations. The Resolution on the Mandela Rules was scheduled to be discussed in the Committee of the Whole on Thursday 21st May. Having attended the debate the previous day, I was prepared for a very long and stressful Thursday. However, in the case of this Resolution negotiations in the ‘informals’ meant that compromise had been achieved before and the Resolution passed smoothly. It was exciting to be able to witness this decisive step in an international standard-setting process of this kind, which has such an impact on our work in Uganda. It will be useful, in using the new standards, to know something about where they come from and how they have been negotiated and adopted. They have universal legitimacy. This is because every nation had an opportunity to participate and to contribute, the input was cross-regional and inclusive. The decision to adopt the Rules was collective. I thank the Penal Reform International team, particularly Andrea Huber and Olivia Rope who have tirelessly followed the process. Your contributions and innovative ideas have lifted us to new heights. Read the text of the Resolution. See also a version showing the substantive revisions. Read about the revision process. Listen to a podcast by PRI’s Policy Director on why the Rules needed to be revised and what the changes could mean for prisoners, prison staff and for prison management. 1. Figures provided to Foundation for Human Rights Initiative (FHRI) by the Uganda Prison Service, October 2014. 3. Appeal No.3 of 2006. 4. Figures provided to FHRI by Aliyo Naatulunda, Uganda Prison Service on 12th March 2015. 5. Section 1, Mental Health Act, 1964. 6. Section 48, Trial on Indictment Act. Photo copyright: Scott Langley, 2014. With kind permission.